I began to think maybe, just maybe, I could cobble together enough of a display to keep a pleasing view to the outside through the fall holiday season. As you’ll recall, I already have clear net lights attached to the balcony’s perimeter — a perfect backdrop for festive interior celebrations, provided the lights aren’t just drawing attention to dried, shriveled plants. So, I went about weeding out the brown stems from my railing planters, removing all the dead potted plants sitting on the decking and sweeping away the leaves and other detritus left by this year’s container garden. I bought a handful of cold-tolerant fall plants, which had already been hardened by sitting out on the local home improvement store’s exterior display racks, and started to fill in the voids in the railing boxes. I first selected two green and purple heads of kale with frilly edges that unfurl like a supersized rose. I’ve been intrigued by the ornate specimens for some time after seeing them in the City’s fall displays. 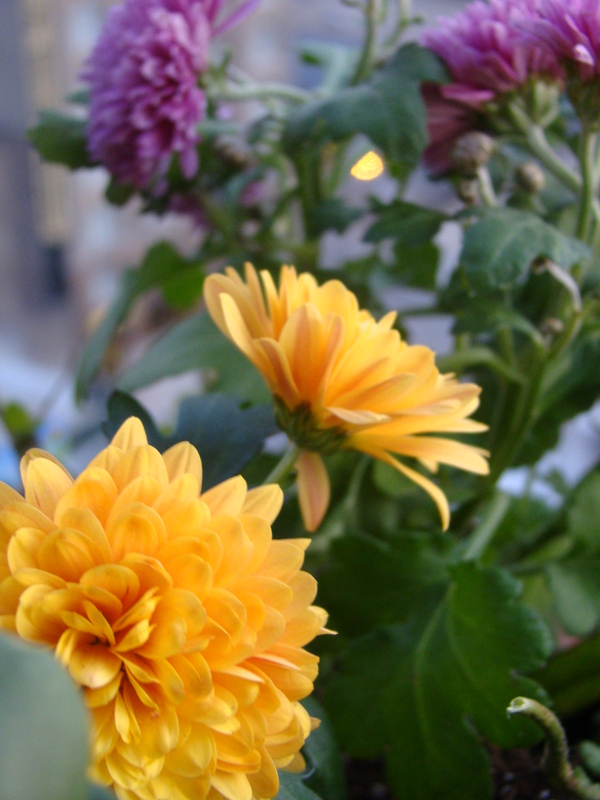 I also bought pansies with purple and yellow-orange blooms and mums in lavender, rust and gold. I mixed these newbies in among the plants still standing and spread randomly over three 36-inch containers: petunia baby duck, lobelia, tweedia (no blooms, but healthy green foliage), Nigella, royal blue petunia, marigold disco flame, and there are a few unopened lisianthus buds. What I’ve wound up with are planters that, though not as lush as they were at summer’s peak, are entrancing in their own right. I mean you’ve gotta respect flowers as delicate as Nigella holding their own against a cold drizzly day like today. And barring drastic temperature drops, they should hold on through Thanksgiving. Beyond that, everything else is gravy (pun intended). Hello Avis, glad to know that the net light is still working! It would definite make your balcony look very nice during Christmas. 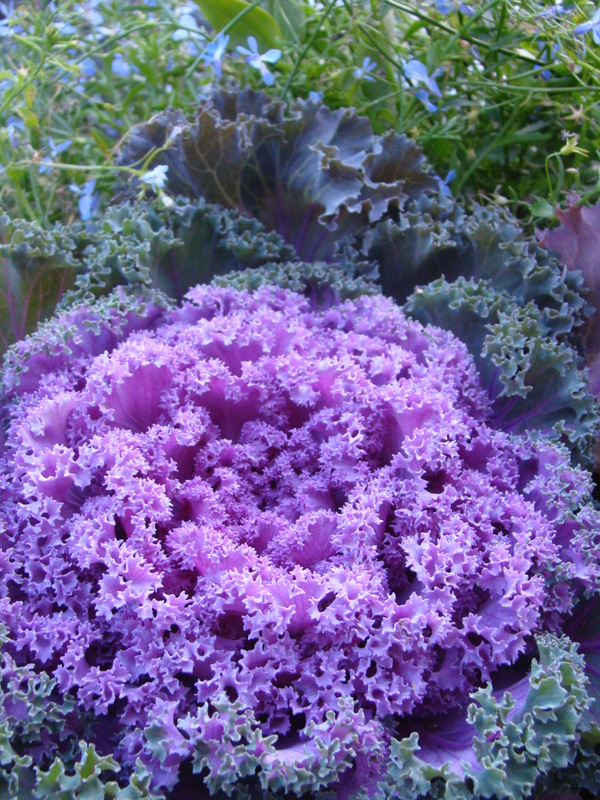 Oh, I love that ornamental kale. It’s so attractive and outstanding 😀 Have a fun-filled weekend! I wish I could rig up some lights too. Sounds like a festive and cozy look! I love getting a batch of new cold-tolerant plants. I was looking at all the ornamental Kale planted along Michigan Avenue this week and was wondering if other people looked at it and were inspired to go out and buy it too. I love the pansies, their colouring will bind the whole colour scheme together. My garden is looking rather sad at the moment, I should really buy some more winter flowering plants.